As we eat the wild hogs and sour greens while washing it down with the dregs of this year's new wine may the worst be behind us. For many 2010 was a year of hunker down, make do and get by. 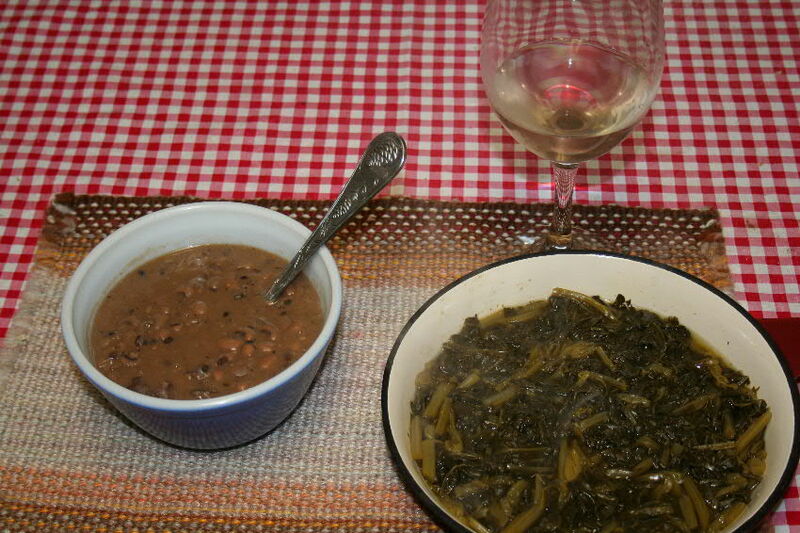 The dawning of January 1, 2011, was welcomed with a traditional Southern good-luck meal consisting of black-eyed peas, greens and smoked pork. Corn bread is a traditional accompaniment, but $3.00 gas prohibited a trip in town to the store for a single item. I do not garden , so a can of mixed greens had to do instead of a large pot of washed, stripped and cut up collards on the back of the stove producing a pungent, some would say stinking, odor in the house. 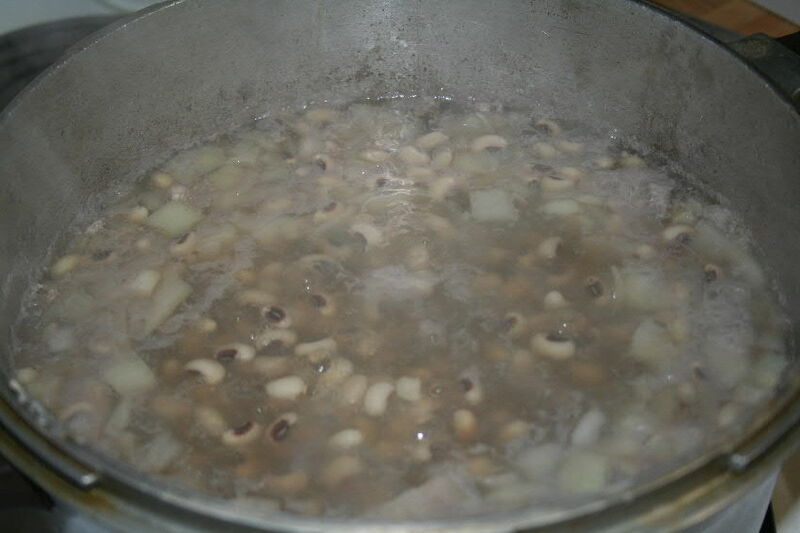 Black-eyed peas and onions preheating prior to pressure cooking. I had started at 3:00 AM with the soaked 88 cent package of peas from the Dollar Store. I had already thawed and marinated slices of Texas wild hog meat in brine and cane syrup. This meat was patted dry with paper towels and then put into the smoker over hickory coals for three hours – just enough to give smoke flavor to the meat, but not dry it out. At 10:00 AM, the partly expanded peas, one large diced onion, salt, pepper and the cut up hog meat was put into a pressure cooker. After reaching operating temperature the beans were allowed to cook for 20 minutes, which finished them off and tenderized the hog meat. 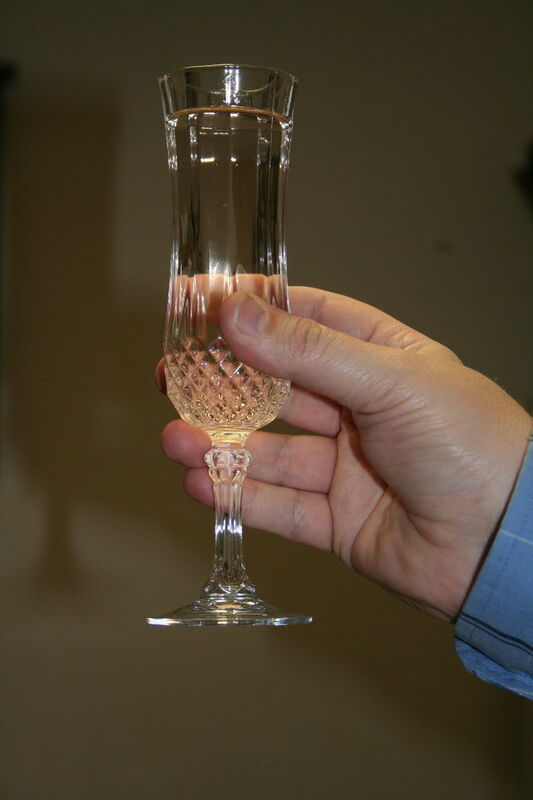 Also in the early morning hours of the New Year the pear wine was decanted and bottled. The dregs containing the sediment were put into a pitcher in which the sediment settled prior to pouring a small glass for the meal. Drinking the dregs of the old year seemed to provide some solace in preparation for facing the year ahead. Opening and heating the canned mixed greens proved to be the simplest part of making the meal. The old year was worthy of no pretence or celebration, and the New Year’s meal was consumed with the hope of better times with a dash of vinega -pepper sauce on the greens to steel me for its ups and downers, for there will be both..
As I had greeted the New Year by myself there was no need to set plates on the table as I “supped sorrow with the poor” that all too many are becoming. Stephen Foster wrote that phrase in his song “Hard Times” along with “Many days have you lingered by my cabin door. Hard Times, Hard Times, come again no more. I have the same wish for everyone. The first day 2011 started well with a friend unexpectedly bring me a fresh road-killed deer to put some meat in the freezer for myself and my dogs. From that deer I made sausage, messy, but eatable. Perhaps this is an indication of what the coming year will be – a messy one that is going to need a lot of work, but having a positive outcome. May good fortune be visited upon you all as we fight hour way through “The Great Recession ” to “The Messy Recovery.” Maybe we all will see some of that next year. Some say they are now, but far, far from all. For those on retirement incomes, this “recovery” seems to be a slow, halting and uncertain proposition. The new wine holds promise. A toast to friend and stranger alike for good health and good fortune in 2011. Wm. Hovey Smith, The Backyard Sportsman, 2011.